Shepherd William Hedges was a retired shepherd living in Westington, Chipping Campden, when in 1909 Cecil Sharp collected from him a large repertoire of folk songs that included We Shepherds are the Best of Men. Among other songs he sang were Horses to Grass, The Three Butchers and a version of Jack Ridler’s Oven, a song peculiar to Gloucestershire. William’s place of birth is given variously as either Hannington, Inglesham or Lechlade and in 1851 he was living in Hannington with his parents, Henry and Martha and siblings Joseph, Isaac and Henry. In 1861 William was lodging on a farm at Westbury-on-Trym but by 1871 was living at Old Coombe, Campden with his wife, Emma and children Hannah, Fanny, William, Thomas, Charles, Fred and Albert. In 1911, William was described as a widower and living in the Almshouses. William and Emma’s son, William, was also married to an Emma and I believe they are the grandparents of Campden resident, Tony Hedges. NB. 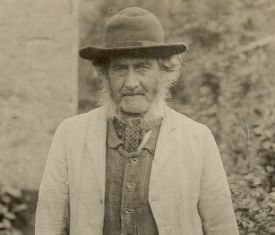 The photograph is believed to be Shepherd Hedges though it could be Shepherd Trinder.